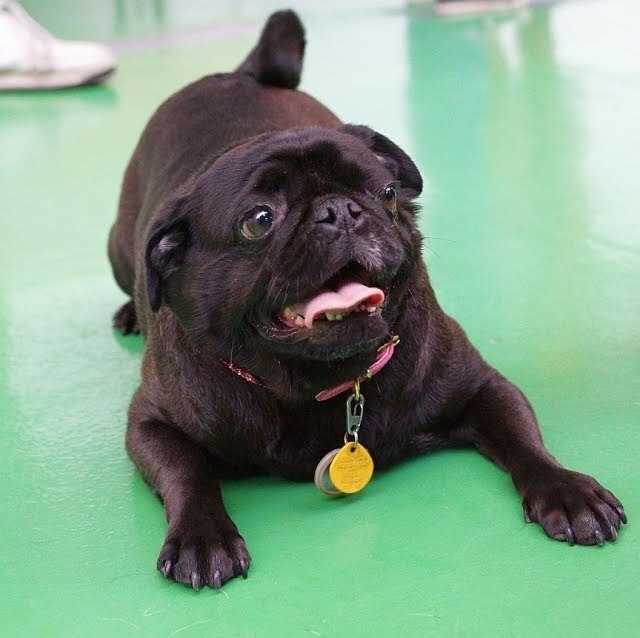 Bellatrix, I'm a Pug! : Really mom?!? Do you know me at all??? The 'rents are all super guilty lately. They went away on vacation last week and left me with Grandma. I managed to get into a bunch of trouble while gone, and when they came to pick me up, they tried to make it up to me....I mean they left me, so that they could hang out with a freaking Mouse! A Mouse that lives in Florida no less! 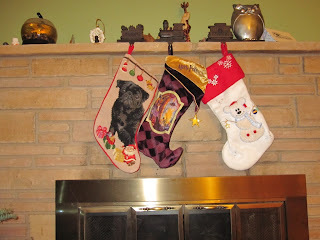 Mom says I should be happy I'm named after a Harry Potter character and not after said Mouse.....Anyway.....once home we decorated for the up coming holidays. Once again my stocking is up and ready, all it needs is some treats and chewies! Mom didn't have to work today, but I got dropped off at daycare anyway. She said she had to go Christmas shopping and they don't allow pugs. 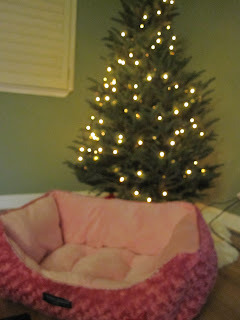 All I know is that I got home and this giant pink bed was under the tree...for me. REALLY?? 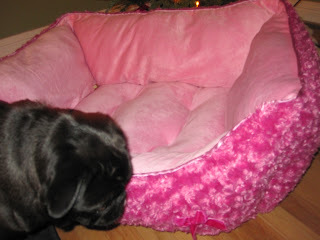 A giant PINK bed with a bow even. Does mom not know me at all? I am so not a pink bed pug. What was she thinking?? Shhh...don't tell the 'rents, but I really do kinda like this bed. 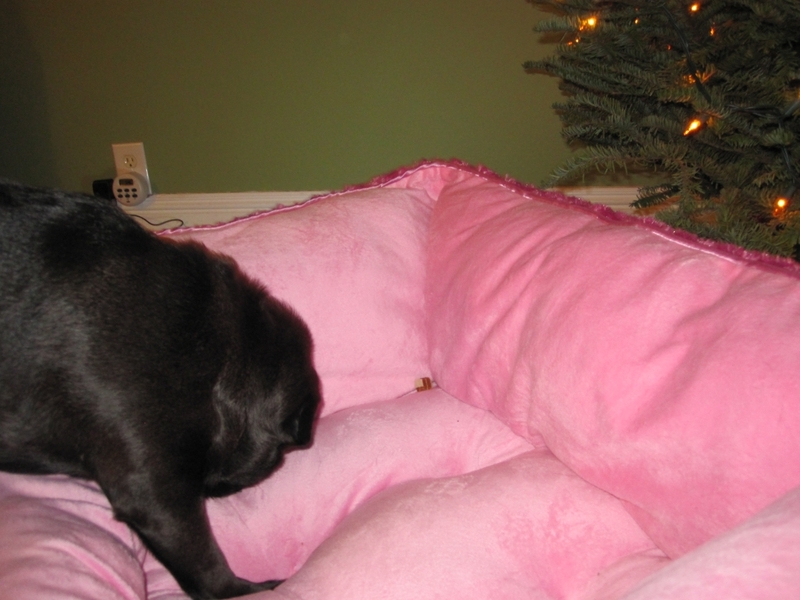 I guess a big PINK fuzzy bed isn't so bad after all. So don't bother me....I"m sleeping. That looks reeeaally comfy. Who cares what color it is. We must say though you do look great in pink. Noodle's comment made me BOL! And Mommy snorted. Oh Dutchie....come on over!! Woot Woot! I know a certain spotted bed hog who can help fill up your bed. Your PINK bed. It does look pretty comfy. If you're a girl. Or a hermaphrodite. Or Dutch. Comfy and you might have a black and white companion, how can you lose Bella? Hehee! I'm laughing at Noodle's and Pug's comments. 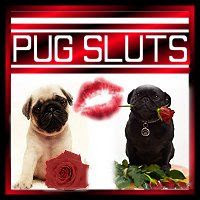 There's a lot of funny pugs out there. I think you should ignore the pick fru-fru-ness of it all, and just enjoy the how comfy it is! It looks like you have enough room for Duchie and Spencer. 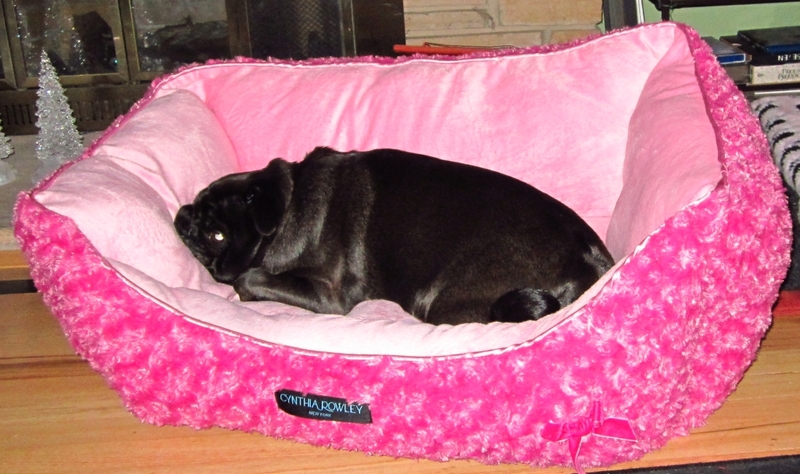 Belly, I love the way that giant pink furry bed contrasts with your black fur. Noodles are you hittin' on Belly or just after her fuzzy pink bed?